After extensive research and data from the existing preheater systems, and at the same time considering the characteristics of raw materials and fuels available in cement plants, the latest generation of Sinoma-tec preheater system represents a comprehensive upgrade from earlier generations. This updated system features optimized process and environmental performance. While operating with low system resistance and energy consumption, it will further contribute to reduced investment in construction investment. Also the level of emission of harmful components in the exhaust gas, such as NOx, and Sox has been significantly improved. The new design allows to make use of the full value of resources. It also permits to utilize all kinds of wastes as alternative fuels or additives, which allows the plant to develop towards an ecological, greener production. With environmental and ecological concerns, this new system is not only more cost effective but also more environmentally friendly. Suitable for a wide range of raw materials and fuels; the precalciner is uncomplicated in structure and easy to operate. Ready solutions for different fuels, including bituminous coal, anthracite, inferior coal, heavy oil, crude oil and natural gas. Relatively low exhaust gas temperature, low pressure loss and energy consumption; highly efficient cyclone designed f Structural Features: or separating materials and gas. 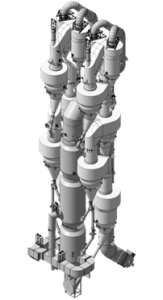 Sinoma Specialises in design of fabricated structures for Preheater tower. The unique design of preheater columns will ensure speedy erection .